Model predictive control (MPC) is a promising alternative to rule-based control since it is more suitable to control increasingly complex buildings and thereby realising energy savings and comfort improvement. Practical implementations are however hampered by the complexity of MPC and the expertise required for developing MPC. Therefore, a toolchain for automated control and optimization (TACO) has been developed that automatically translates an object-oriented Modelica model into an eﬃcient MPC code. Since object-oriented models from the Modelica IDEAS library are used, the expertise requirement and development time are reduced signiﬁcantly. TACO has, however, not yet been applied to a real building and its robustness in real operation still must be demonstrated. The purpose of this paper is to provide a comprehensive overview of the steps that are proposed for implementing an MPC using TACO. hybridGEOTABS buildings are buildings equipped with a ground source heat pump (GSHP), thermally activated building systems (TABS), a conditioned ventilation and, optionally, additional heating and cooling systems such as variable-air-volume boxes or radiators. 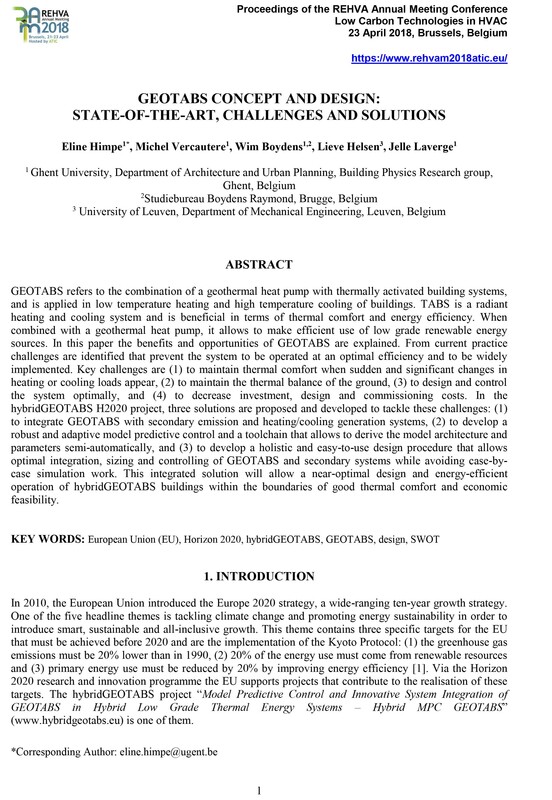 GEOTABS can be very energy eﬃcient but its controllability is limited and thermal comfort is therefore not always guaranteed. hybridGEOTABS systems have the potential to eliminate these problems, provided the diﬀerent system components interact properly. 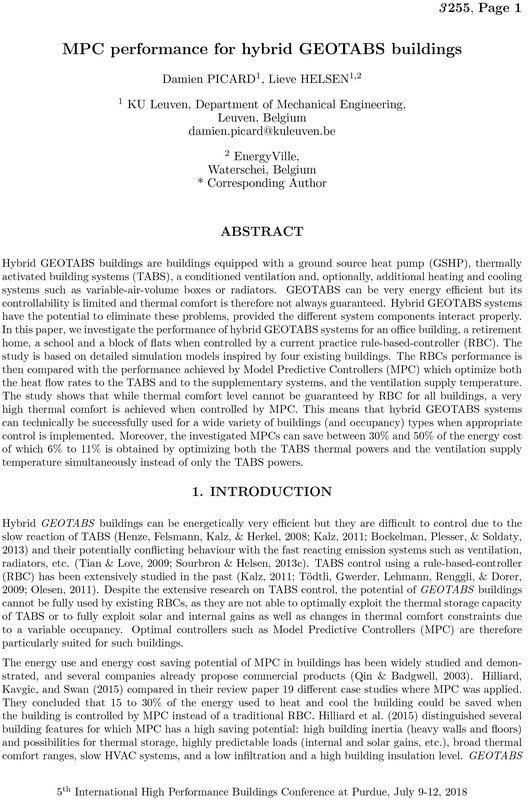 In this paper, we investigate the performance of hybrid GEOTABS systems for an oﬃce building, a retirement home, a school and a block of ﬂats when controlled by a current practice rule-based-controller (RBC). The study is based on detailed simulation models inspired by four existing buildings. 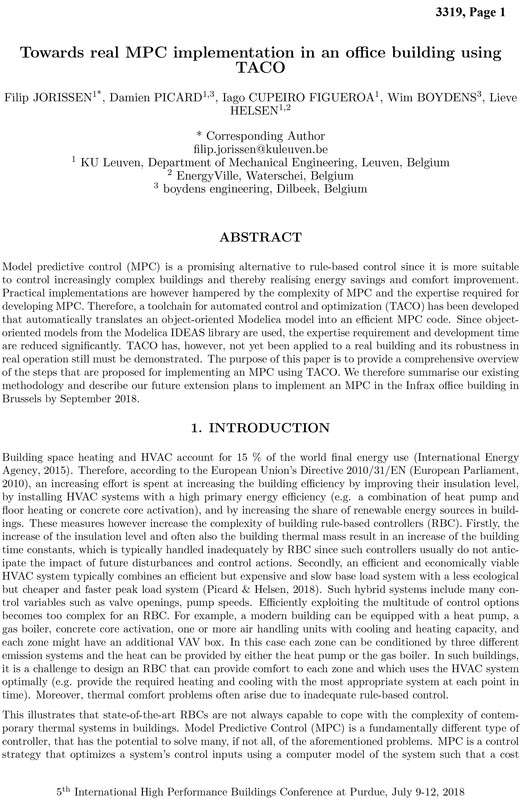 In order to improve the energy efﬁciency of buildings, optimal control strategies, such as model predictive control (MPC), have proven to be potential techniques for intelligent operation of energy systems in buildings. However, in order to perform well, MPC needs an accurate controller model of the building to make correct predictions of the building thermal needs (feedforward) and the algorithm should ideally use measurement data to update the model to the actual state of the building (feedback). 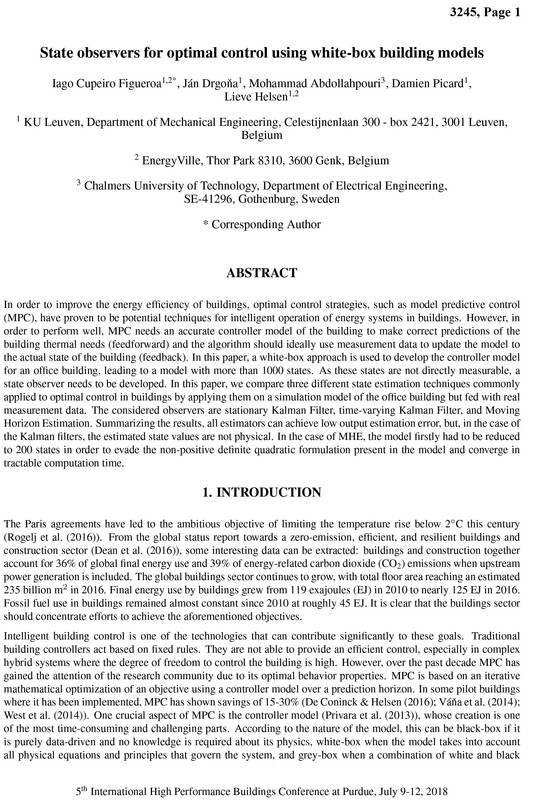 In this paper, a white-box approach is used to develop the controller model for an ofﬁce building, leading to a model with more than 1000 states. In the early design phase of a building, the task of the Heating, Ventilation and Air Conditioning (HVAC) engineer is to propose an appropriate HVAC system for a given building. This system should provide thermal comfort to the building occupants at all times, meet the building owner’s speciﬁc requirements, and have minimal investment, running, maintenance and replacement costs (i.e., total cost) and energy use or CO2 emissions. Calculating these different aspects is highly time-consuming and the HVAC engineer will therefore only be able to compare a (very) limited number of alternatives leading to suboptimal designs. 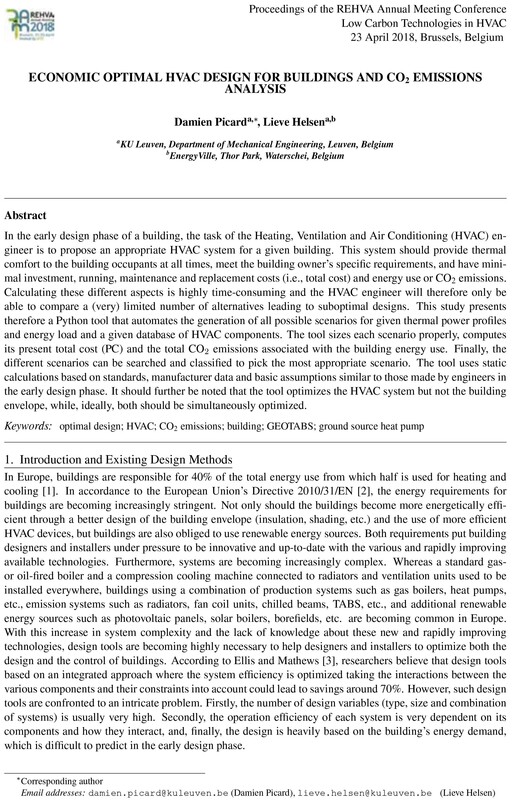 This study presents therefore a Python tool that automates the generation of all possible scenarios for given thermal power proﬁles and energy load and a given database of HVAC components. The tool sizes each scenario properly, computes its present total cost (PC) and the total CO2 emissions associated with the building energy use. Finally, the different scenarios can be searched and classiﬁed to pick the most appropriate scenario. The tool uses static calculations based on standards, manufacturer data and basic assumptions similar to those made by engineers in the early design phase. It should further be noted that the tool optimizes the HVAC system but not the building envelope, while, ideally, both should be simultaneously optimised. 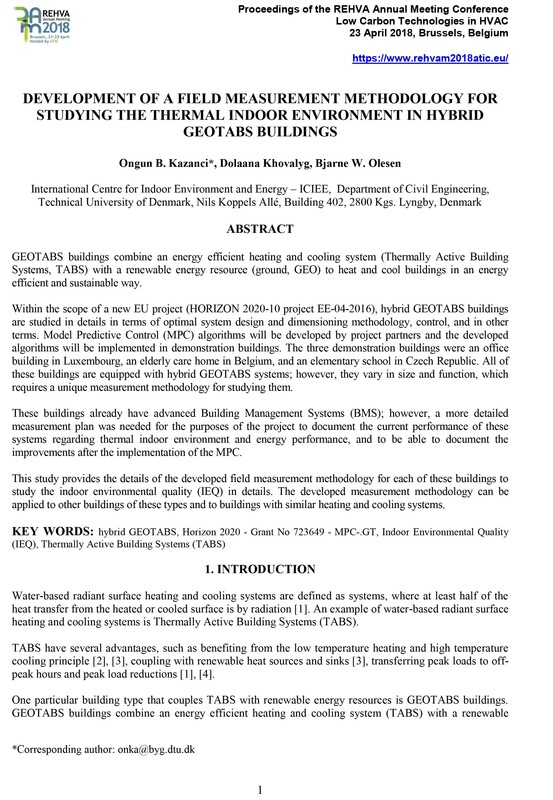 In this paper the benefits and opportunities of GEOTABS are explained. From current practice challenges are identified that prevent the system to be operated at an optimal efficiency and to be widelyimplemented. Key challenges are (1) to maintain thermal comfort when sudden and significant changes in heating or cooling loads appear, (2) to maintain the thermal balance of the ground, (3) to design and control the system optimally, and (4) to decrease investment, design and commissioning costs. In the hybridGEOTABS H2020 project, three solutions are proposed and developed to tackle these challenges: (1) to integrate GEOTABS with secondary emission and heating/cooling generation systems, (2) to develop arobust and adaptive model predictive control and a toolchain that allows to derive the model architecture and parameters semi-automatically, and (3) to develop a holistic and easy-to-use design procedure that allows optimal integration, sizing and controlling of GEOTABS and secondary systems while avoiding case-by-case simulation work. This integrated solution will allow a near-optimal designand energy-efficient operation of hybridGEOTABS buildingswithin the boundaries of good thermal comfort and economic feasibility. This study provides the details of the developed field measurement methodology for each of these buildings to study the indoor environmental quality (IEQ) in details. The developedmeasurementmethodology can be applied to other buildings of these typesand to buildings with similar heating and cooling systems.